We do our best to recycle in our household and this also means putting as little food waste into the landfill as possible. In addition to keeping chickens, we are avid vegetable and fruit gardeners and so a natural way to dispense with vegetable food waste is to compost it. However, we put an intermediate step between us and the compost bin that makes our chickens happy too. We leave a bowl out near the kitchen sink. As we are preparing meals any scraps that would be good for chickens go into this bowl. If the kids bring home uneaten veggies or fruit in their lunch boxes, these get tossed into the bowl as well. So do any left-over cooked vegetables such as broccoli or carrots if there isn't enough left to bother saving it. The following morning our chickens get any of the treats in the bowl. They love this both for the flavor and the play-value. Blueberries and grapes seem to be particularly favored by our girls. Grains - Left over rice, oatmeal, barley or other grain you've had the night before. Unsweetened Cereals - Rice or Corn Checks, Rice Krispies, and Corn Flakes are OK. Lucky Charms may be "magically delicious," but I wouldn't recommend them for the flock. I don't know if sugar is specifically unhealthy for chickens, but I do know that it makes us humans fat, so I advise against feeding sweetened cereals to you chickens. By the way, research suggests that birds don't taste sweet the way humans do. Veggies - Pretty much any cooked or raw vegetable scraps except those listed in the "Don't Feed" section below are OK. Good choices include, lettuce, kale, tomatoes, cooked broccoli, cabbage and chard. Fruits & Berries - any left over apples, pears, cherries, banana without the peel, grapes, blueberries etc. Always on the alert for snacks! Woody Vegetables - veggies that are too hard, or too big for chickens to easily eat should be left out of your scrap bowl. Remember chickens don't have teeth and depend on their gizzard to do the grinding. So avoid vegetables such as uncooked broccoli stems, artichoke leaves, avocado skins and pits, and other really woody vegetables. 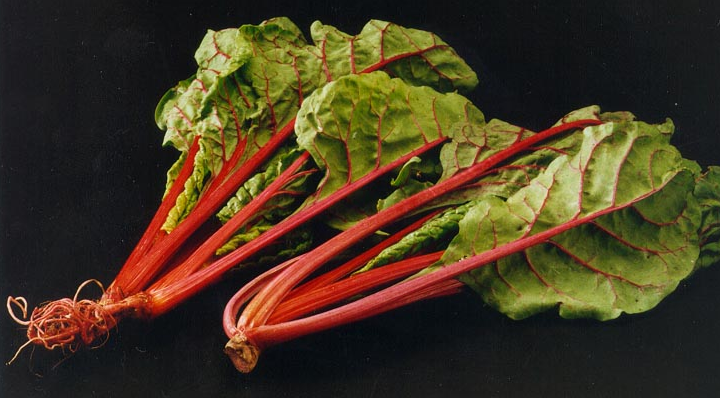 These can go into your compost pile. Potato Peelings - these contain a toxin that is harmful to both people and chickens. However, you can feed your flock a cooked potato skin since cooking neutralizes the nasty. Moldy Food - things that have clearly gone bad and you wouldn't eat shouldn't be given to your chickens either. That said, I do think it's OK to give "less than perfect" items to your chickens. These are foods that may be wilted or slightly yellowing (lettuce, spinach, kale etc) but are have not reached the stage when they are actually decomposing. Raw potato peels contain a toxin and should not be fed to chickens. 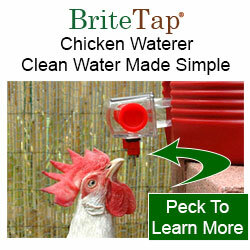 Posting sponsored by ChickenWaterer.com, makers of the BriteTap chicken waterer. 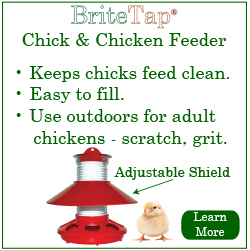 The BriteTap waterer shields water from dirt and poop. The water stays clean and there are no messy pans for you to wash out. 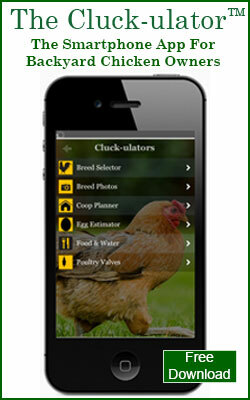 For more information visit our web site to learn more about our products and chickens. Just a tiny added note about leftover cooked foods like rice, veggies, etc - ok as long as there's no onions, onion powder, or onion salt in the seasoning - onions are toxic for dogs too. Brown rice has nutrition that white rice doesn't. Of course chickens will eat either white or brown cooked rice but for our personal choice we've cut out the white rices and white flours from our diet - as a result no whites go as leftovers to the flock either. I just read on another site that spinach is NOT ok to give the hens. You listed in the wilted section of this article...thoughts? I can't comment on this without understanding why this other author thinks spinach is a problem.